(Bloomberg Opinion) -- The annual Amazon.com Inc. shareholder letters from CEO Jeff Bezos are eagerly awaited in Silicon Valley for pearls of wisdom from the world’s richest man and an admired business leader. This year’s edition was extra revealing, although maybe not in the way Bezos intended. It’s hard to explain the slowdown in Amazon’s merchandise sales growth. If anything, it seems as if Amazon is grabbing a larger share of e-commerce sales and that the internet is stealing more sales from physical stores, which have accounted for something like 90 percent of all U.S. retail sales. And yet Amazon’s retail sales growth — although still impressive — is slowing noticeably. 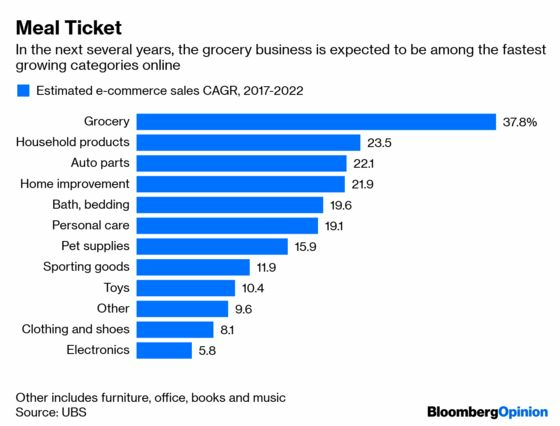 For context, total e-commerce sales in the U.S. rose about 14 percent in 2018, according to calculations from figures released by the U.S. Census Bureau. Amazon generates a large majority of its sales in the U.S., and it’s somewhat surprising that Amazon’s online sales aren’t growing that much faster than the e-commerce category. Bezos said the value of Amazon-sold merchandise in 2018 was $117 billion, which is different from the $123 billion figure the company reported. 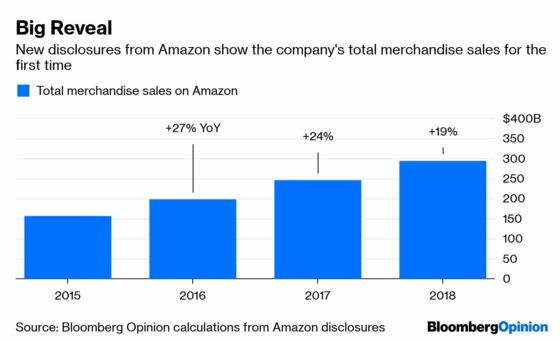 We suspect the difference is explained by Bezos limiting his number to physical merchandise, while Amazon's $123 billion disclosure in its financial statements includes digital goods such as e-books. Our figures for GMV from 2015 to 2018 are based on Amazon's reported self-sold merchandise value, which means our GMV calculations might be slightly off.